In a large saucepan, combine 2 quarts of the water with the brown sugar, cinnamon sticks and star anise and bring to a boil, stirring to dissolve the sugar. Remove from the heat. Add the rum and bananas and let stand for 4 hours. Meanwhile, in a medium saucepan, whisk the remaining 1 cup of water with the granulated sugar, cocoa powder and espresso powder and bring to a boil. Whisk in the cream and simmer over low heat, stirring occasionally, until thickened, about 40 minutes. Stir in the chocolate until melted. Remove from the heat; keep warm. Light a grill. Drain the bananas and pat dry with paper towels. Put the turbinado sugar in a shallow bowl. Cut each banana in half lengthwise; dip each half in the sugar to coat evenly. Grill the bananas over a hot fire until they are richly caramelized, about 1 minute per side. Transfer 2 banana halves to each of 8 bowls. 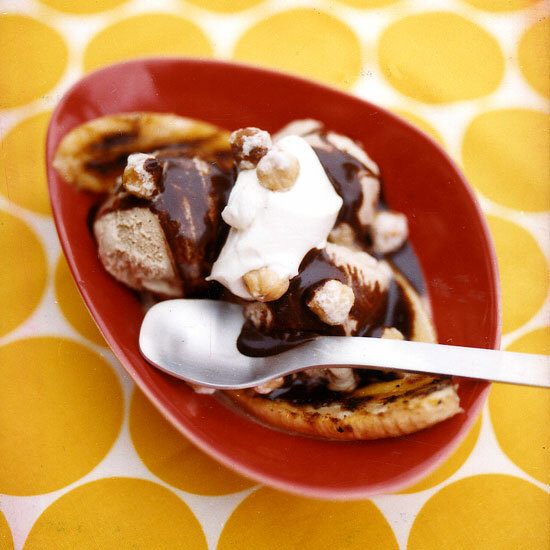 Place 3 scoops of ice cream in each split banana and top with 1/4 cup of the mocha sauce. Dollop whipped cream over the splits, top with the nuts and serve.